The Recorder is a simple and easy to use recording application that lets you record and save audio as sound files in the OmniPlayer system. The titles of the sound files you create appear in the Database explorer so that you and other users can then load and use the audio in other OmniPlayer applications. If you want to perform two or more simultaneous recordings on the same workstation, you can open as many recording windows as you need, and assign the appropriate audio device. 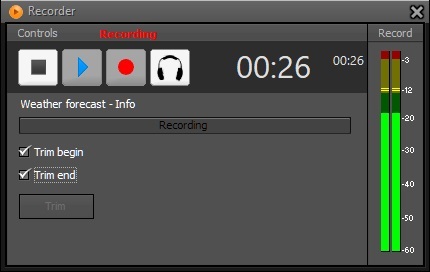 If you save the audio while Recorder is recording, you can begin to edit the file immediately.